Greetings and Happy New Year (and Year of the Dragon)! This issue of AEMS News and Reviews includes four film reviews as well as news of upcoming spring and summer activities. March 1 is the deadline for K-12 educators and graduate students planning to apply for the 2012 NEH Summer Institute for Teachers. See details in this issue and on the program's website at www.aems.illinois.edu/nehchinesefilm. From March 15-17, AEMS once again hosts the film/video screenings at the annual meeting of the AAS (Association for Asian Studies), this year in Toronto. A full list of films to be screened will appear on the AEMS and AAS websites on or around January 31. And beginning on February 7 with Follow Your Heart: China's New Youth Movement, AsiaLENS presents its Spring documentary film series in Urbana-Champaign, IL. In this winter issue, we feature three films from AEMS' Digital Asia project (www.digitalasia.illinois.edu). Kenneth Dean's Bored in Heaven, reviewed by Jonathan H.X. Lee, is a visual exploration of the performance of contemporary religious rituals in southeast China. 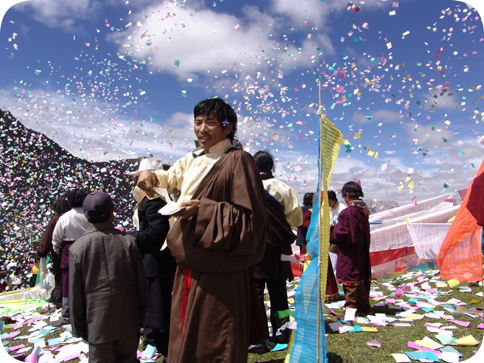 Two films on environmental issues, in China (Lessons of the Loess Plateau by John Liu, reviewed by James E. Mills) and in Tibet (Shielding the Mountains by Emily Yeh and Kunga Lama, reviewed by Tracy H. Allen), give hope to environmentalists everywhere by demonstrating the different ways local communities are acting to maintain the delicate balance between man and nature. The fourth film set, Can't Go Native? and supplementary DVDs by anthropologist and filmmaker David W. Plath, reviewed by Anne Prescott, looks at anthropologist Keith Brown's fifty-year relationship with the Japanese community he studied. We at AEMS hope you will enjoy reading about these films and perhaps adding them to your film library. Produced and written by Emily Yeh. Directed by Kunga Lama. 2009. 20 minutes. In English and Tibetan with English Subtitles. Reviewed by Tracy H. Allen. The documentary film Shielding the Mountains presents a visually captivating and insightful look into one the most remote and environmentally endangered landscapes on Earth. Tibet's ecosystems are biologically unique and diverse. Rivers rise on the plateau that become the lifeline for nearly two billion downstream users. However, as traditional Tibetans meet the modern world, checkerboard patterns are carved into forested mountain slopes, pollution runs freely in once pristine waters, erosion lays grasslands bare, and wildlife is stripped from the land. While annexation, globalization, rapid economic and population growth, and climate change lead the list of blame, Tibetans themselves are fighting to stem environmental destruction by embracing their heritage. Shielding the Mountains is an evocative and compelling short film that uncovers how Tibetans view nature and why they are motivated to protect the environment. Produced and directed by John D. Liu. 2009. 52 minutes. In English. With footage of stark landscapes, evocative images of villagers, and haunting folk song performances reminiscent of the 1984 film Yellow Earth, John Liu introduces the viewer of his 2009 film Lessons of the Loess Plateau to a culture and place that is surely one of the most intriguing and important on earth. For many in the West the Loess Plateau in China remains an alien and little known part of the Middle Kingdom. The Loess Plateau is a physiographic region in Northern China characterized by a deep mantle of wind deposited silt. Loess deposits in this region can reach great depths and are associated with distinctive landforms and ecosystems. Traditionally, people living in the Loess Plateau adapted well to these conditions by developing unique architectural, agricultural, and settlement patterns. The purpose of this film is not just to explore such unusual physical and cultural characteristics. Its primary purpose is to document a large scale environmental restoration project undertaken by the Chinese government and the World Bank in the region. Directed by Kenneth Dean. 2010. 80 minutes. In Chinese and English with English subtitles. Reviewed by Jonathan H. X. Lee. Bored in Heaven, a film by the renowned scholar of Chinese religion and Taoist studies, Kenneth Dean, is a rich anthropology of the revival of local popular Chinese religious expression in modern China. The Great Proletarian Cultural Revolution (1966-76) attempted to modernize China, in part through a complete societal secularization campaign. 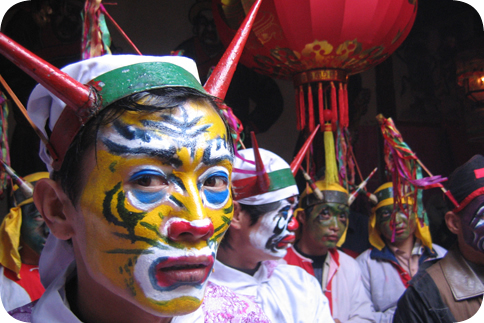 Religion was seen as superstitious nonsense that held China back in time. Scholars studying contemporary Chinese religion at first argued that religion was dead in China, since local religious festivals and rituals were no longer flourishing. However, beginning in the mid-1980s, and even more so through the 1990s and first decade of the twenty-first century, scholars have increasingly painted a lively, rich, and robust portrait of the revival of Chinese popular religion. Dean provides a visual anthropology of this religious revival in modern China in his film Bored in Heaven. Based on Dean's twenty plus years of ethnographic fieldwork, Bored in Heaven is divided into five distinct chapters. These cover the God of Theater, ritual processions, Taoist rites, spirit mediums, and rituals, with a short Introduction and Conclusion. Produced and edited by David Plath. 2011. 56 minutes. In English. Produced and edited by David Plath. Conversations chosen by Ishizawa Makiko. 2011. 58 minutes. In Japanese with English Subtitles. Produced and edited by David Plath. Directed by Chet Kincaid. 2011. 90 minutes. In English. 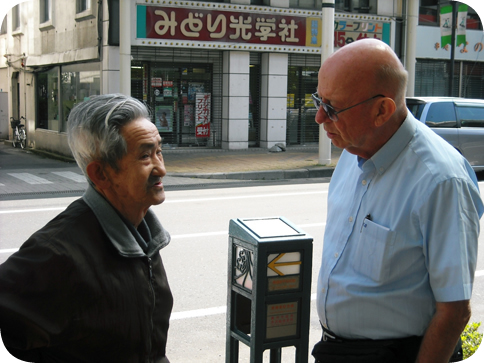 Why would an Iowa farm boy become an anthropologist and devote his entire career to the study of a rural community in Japan, visiting regularly, sometimes for extended visits, over the course of 50 years? How have the people in that community affected the life of this American academic, and how have their lives changed over 50 years? Over time, the bond between the American anthropologist and the people grows so strong that in many ways he becomes a part of the community. But can he ever really be one of them? Can he really "go native"? The documentary film Can't Go Native answers these questions-and more-with a very personal look at anthropologist Keith Brown's relationship with the people of Mizusawa, Iwate Prefecture. Produced by Brown's colleague and friend, anthropologist David Plath, Can't Go Native? and the supplementary DVD More About Mizusawa are valuable resources for educators and others who want to enrich their knowledge of rural Japan. A third DVD, Conversations in Mizusawa, uses dialogues from Can't Go Native? as tools for Japanese language study. The Asian Educational Media Service (AEMS) at the University of Illinois in Urbana-Champaign will host the 2012 NEH Summer Institute for Teachers Chinese Film and Society from July 9-August 3, 2012. The program will include films from the May Fourth period to contemporary times, both documentary and feature, and is open to middle and high school educators. The Institute is co-directed by Nancy Jervis and Gary Xu of Illinois. Institute faculty include Paul Pickowicz (UCSD), Stanley Rosen (USC), Myron Cohen (Columbia). AEMS will present Film Expo 2012: Asia in Current Motion at the 2012 AAS Annual Conference from March 15-17, 2012 in the City Hall Room on the second floor of the Sheraton Centre Hotel in Toronto. If you are attending the conference, please be sure to pick up a film expo program upon registration to view films and screening times. Or plan ahead by checking our website after February 1.